As more and more people today are playing sports, going to the gym or changing their lifestyle to become more healthy and fit. They are constantly looking for more ways to bring all their gym items and sporting equipment with them. Most people are achieving this by just using a plain old backpack and constantly running out of room. A business supplying a duffel bag/sports bag would show they business is all about people becoming more healthier and fitter and show they do care about people become the best they truly can. Business owners can help their customers feel better about the choices they make and get some exposure by offering promotional products like the Soho Sports bag and the Stellar Duffel Bag. Features removable shoulder strap and colour accents. Promotional bags are not all created equal. Business owners, managers, and marketers often receive the sage advice that the best promotional products are tailored to their potential clients' or customers' lifestyles and needs. This advice rings true in a wide variety of ways, particularly when it comes to athletics. That's where Branded Sports Bags come in. One of the main benefits of designing an inexpensive Promo sport duffle is that it will be used over and over again. Distributing this kind of gift to sports teams, whether they be major league or little league, can garner a lot of extra attention. Think about it. If every player on even a high school sports team is regularly using his or her duffle bag to carry gear to and from practice and games, there is a lot of potential for increased brand recognition. Plus, if the sports team is popular and has devoted fans, they will be much more inclined to purchase athletic products from a company endorsed by their team. 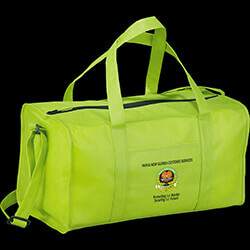 Promotional Duffle bags aren't just for products or companies specifically operating within the sports industry, though. Any company producing products or offering services tailored to outdoor enthusiasts, or sports fans in general, can really benefit from this kind of exposure. Think about intended use when coming up with a design. Look for helpful features like separate pockets, heavy-duty fabrics, and well-crafted zippers. After all, any sports bag needs to be able to withstand a good deal of use and abuse. Whether the logo belongs to a business catering to athletes and sports enthusiasts or a sports team looking to promote itself more actively, it can be expertly designed right here online. With a little bit of thought and some help from one of the premier custom promotional product distributors in Australia, sports bags can be more than just something throw all that gear in after practice. They can double as cheap and effective advertising for companies willing to endorse their favorite sports teams. The athletes get free duffles, the companies get free advertising, and everyone wins. Get started designing the perfect sports bag online today.